* The Brexit vote - and I'm still a bit traumatised - got me thinking about the UK's working classes - now being casually demonised by many as dumb, racist and worse, the idiot turkeys who voted for Christmas because they don't like seeing brown faces on their high street. It got me thinking about a now almost forgotten moment in 20th Century Britain - when - as fascism rose across Europe - the working classes of East London united and fought street battles against the Blackshirt movement - and turned back the tide. It was one of the most extraordinary moments in modern British history - and one group of often demonised, poor and ill-educated emigrants - or economic refugees - united with another - their enemies - to defeat the Blackshirts. It was the Battle of Cable Street. And it was the Working Classes Wot Won It. * It's easy to forget. but in the 1930s, with the great democracies reeling from the Great Depression, Fascism was on the rise and seen by many as the future. And not just in Italy, Germany and Spain. 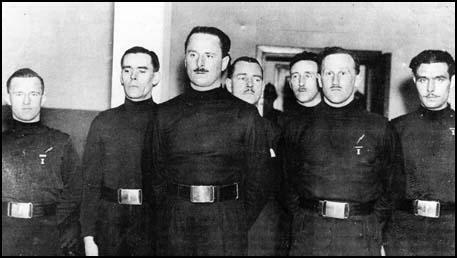 In Britain, firebrand and demagogue Oswald Mosley and his British Union of Fascists - the Blackshirts - represented a major political movement, at one stage, with over 50,000 members. And Mosely took his cue from Mussolini and Hitler, using the politics of hate, mass protests and paramilitary display to rally the disaffected masses and threaten their opponents. It was a powerful, seductive message in a time of great want and turmoil. The same kind of message we are seeing all over Europe again today, in Greece, Hungary, France and even in Britain. You are not to blame for the sorry state your country finds itself in! It is the outsiders, the Jews, the immigrants, the left-wingers and liberals! And Mosely had his sympathisers, both with the Working Classes, who he claimed to identify with (despite being a toff) and many in the ruling classes. It has recently emerged that the British security forces investigated what amounted to a high-level fascist plot, involving many across the British power-elite of the time. Fascism, and the belief that it could triumph in Great Britain, were ideas that were in the air. As the Nazis shouted at the time, "Tomorrow Belongs To Us!" The Daily Mail was an early supporter of the BUF - running a headline "Hurrah For The Blackshirts" that reflected not so much a great treason or extreme view on the part of the newspaper, but the wider feeling that democracy, or liberalism had failed and fascism offered a real alternative. It was against this backdrop that Mosley organised what was to be his "March on Rome" - or at least a huge demonstration in the heart of London's most (as the BUF put it) "Jew-Ridden and Communistic" neighbourhoods. The streets around Whitechappel and the East End. It was part of a campaign of terror already played out in Germany and Italy. Blackshirt gangs had been active in the East End, beating up Jews and Irish immigrants, breaking up meetings and trying to instil fear into their opponents while recruiting the disaffected to their flag. Along with the Jews and Communists, Mosley and his men also had another target in the East End - the very large Irish community of dockers and their families. He had initially courted the Irish immigrants and found many willing to listen to his message. The Irish of the East End - escaping dire poverty at home - were not exactly known for their peace and goodwill to all men. Irish gangs would repeatedly chase Jews or others out of their neighbourhoods, graffiti such as "No Jews On Our Streets" would regularly appear on walls around Whitechappel. Many Irishmen joined the Blackshirts, Mosley's personal bodyguard for years was a Belfast man who later went on to advise the National Front and other Far Right Groups of the Post-War era. So, on October 4th, 1936, as The Blackshirts prepared to stage their biggest ever demonstration in London, few could say for certain which way the Irish of the East End would line-up. But for the large Jewish community, there was no question. If they failed to stand against the fascists now, they knew which way the wind would blow. They had seen what had happened in Germany. But what would the Irish Catholic dockers, no friends to the Jews, do? In the end - on one of the most remarkable days in 20th century Britain, the Irish dockers stood with the Jews, the socialists, the communists and the Union men as they fought back. And fight they did. The Battle of Cable Street saw ordinary men and women take to the barricades to force back the tide of Fascism in Britain. And it really did mark the high-water mark for Mosley and his Blackshirts, the point after which his movement went into terminal decline. 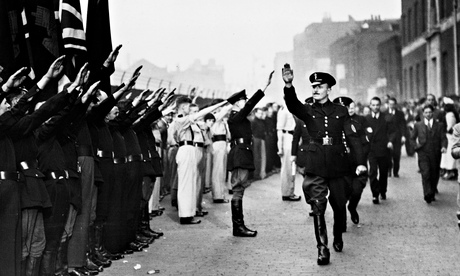 Mosley had rallied around 7,000 Blackshirts, the authorities had provided 10,000 policemen (4,000 on horseback) to make sure they could march against the expected opposition from left-wing groups and ordinary East Enders. What happened was a furious street battle, as the East Enders threw up barricades, fought with the Blackshirts and Police and chanted the Spanish Republican slogan "No Pasaran!" "They Shall Not Pass!" You can see footage of the battle in the vid below - the song is "The Ghosts of Cable Street", by The Men They Couldn't Hang. And it is remarkable footage - this is London, in the mid-30s. An army of black-shirted, Sieg-Heiling British fascists fights running battles with ordinary men and women giving the closed fist Socialist salute. It could be Barcelona or Berlin. ****And here's a recent Channel4 news report featuring Max Levitas - who fought the Blackshirts (and who had a brother who fought with the Connolly Column in Spain (Max spent some time in his childhood in Dublin, you may hear a bit of an accent). Mosley was planning a triumph in London before flying out to Berlin the next day to be married to Diana Guinness, formerly Diana Mitford, at the home of Nazi Propaganda Minister Joseph Goebbels. Adolf Hitler would be their guest of honour. However, as Mosley and his men went into the East End, the anti-fascists learned that he was planning to march through Cable Street. On the 70th anniversary of the Battle in 2011, veterans like Professor Bill Fishman gave their recollections of the day. “I heard a loudspeaker say, ‘They are going to Cable Street,’” said Prof Bill Fishman. “Suddenly a barricade was erected there and an old lorry was in the middle of the road. The people up the top of the flats, mainly Irish Catholic women, were throwing rubbish on to the police. Former textile worker Beatty Orwell, 94, was just a teenager when she joined the fight. “I’d never seen so many people in my life,” she recalls. “There was shouting and shoving, and the police on their horses pushing everyone back. When I spotted Mosley’s lot, dressed in their uniforms like Hitler’s men, I felt sick. Trapped between the barricades and besieged by huge crowds of determined anti-fascists, Mosley's men were forced back. And then the Police Commissioner went to the BUF leader and told him that he had to turn back. There was no way the fascists would march through the East End that day. It was a humiliation for Mosley. He had vowed to take over the East End and rally the working classes (many of whom had voted for BUF candidates in local elections) to the flag of fascism. What he actually faced was one of the most significant, single blows dealt to fascism in Europe before the War. The tide had been turned back, in Britain at least. And while The Battle of Cable Street did not usher in a new era of socialism or universal brotherly love in London, it did show that the ordinary people could organise, fight back and beat the fascists. As we look to far-right groups such as Golden Dawn in Greece and the English Defence League closer to home, it is a message worth remembering. Very interesting story Joe, and thank you for reviving it. It's one of those stories conveniently hidden away, particularly now, as the National Front and EDL seem to be gaining support. I'd love to hear about the connections between the Blackshirts in England, and the BlueShirts and religious fanatics/fascists in Ireland at the time. Hope you don't mind me sharing your Blog on Facebook. Hi Brian, Glad you enjoyed it and thanks for sharing!